Daughter of a bordello madame and an Italian captain of the seas, Angelina Mercy longs for a new life, free from the condemnation associated with her mother’s home in Boston. A former navy man, Jonathan Thomson has accepted God’s call and become a minister of a small congregation. Adrift from his Yankee heritage in the Missouri plains, Jonathan longs for a family of his own. Pursuing Alice, the daughter of the town’s wealthy patron, Jonathan believes he can tame her wild ways and accomplish more as a preacher once so established. When Angelina’s guardian and Jonathan’s seminary professor learns of Jonathan’s misguided intentions, he seeks out a solution to aid both individuals, providing a new home for Angelina in St. Joseph, Angelina and Jonathan are brought together with a strong initial attraction. ​Can Jonathan ignore Angelina’s Gold Earrings, a constant reminder of the implications of her less than pristine parentage? And will Alice succeed in keeping Jonathan from Angelina? 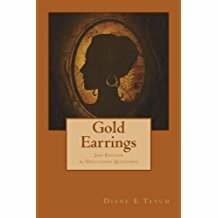 The resilient heroine of Diane E. Tatum’s novel will inspire you in this touching tale of love against the odds.